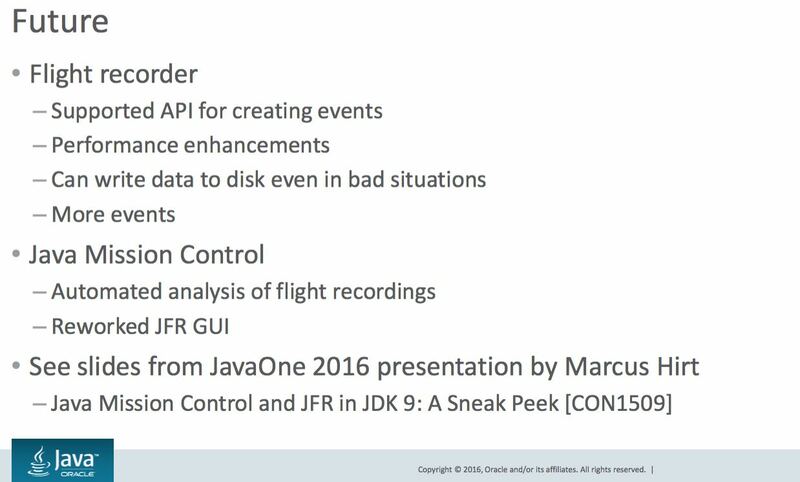 This year at JAX London, Ola Westin of the Java platform group at Oracle presented on Java Mission Control (JMC) and Java Flight Recorder (JFR). After starting with the overview of both JMC and JFR, Westin showed the audience how a recording can be created and analyzed, and then provided the audience with a demo. In this article, InfoQ will walk its readers through Westin’s presentation. Java Mission Control is the graphical interface which helps visualize Java Virtual Machine (the Java VM) behavior with the help of a JMX console (that provides a raw view of the server) and a Java Flight Recorder (that collects, profiles and helps diagnose the application data). 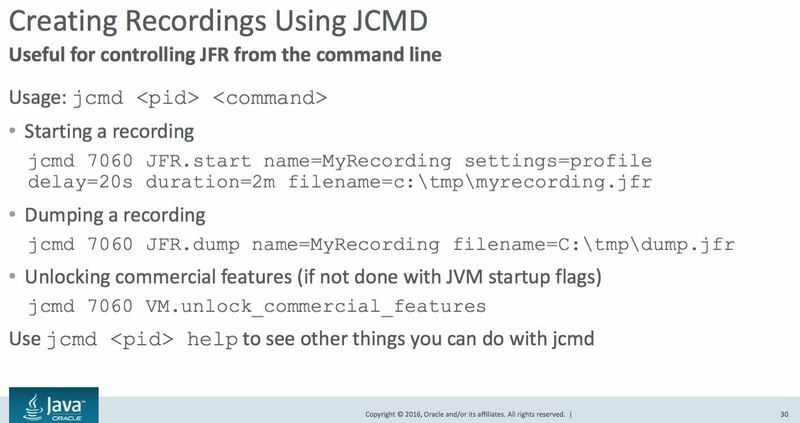 The JMC (command jmc) is bundled with the Java Development Kit (JDK) and is available in the bin directory. Additional logging can be enabled using the –consoleLog –debug options. Various experimental plugins (such as for DTrace, JMX Console, etc) are available for download from within the JMC. 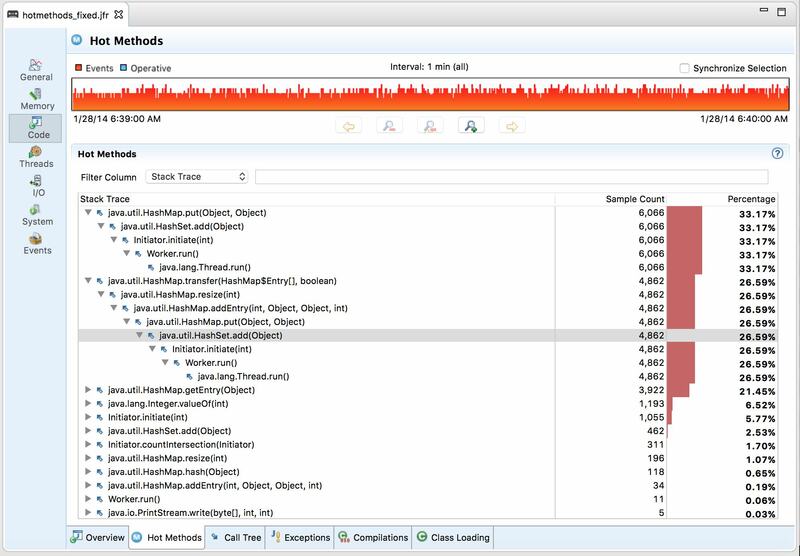 Java Flight Recorder collects information on the Java application behavior as well as the Java VM behavior. 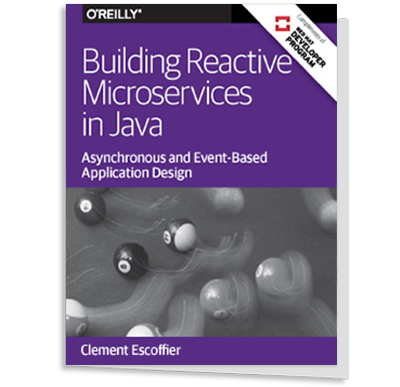 The JFR is built into the Java VM and provides users with runtime information. 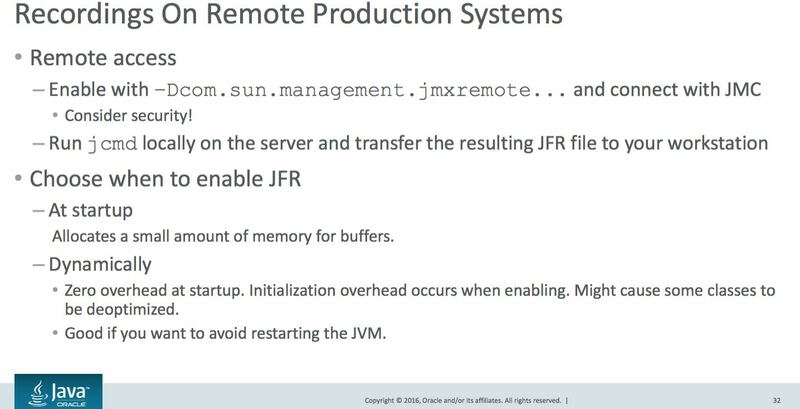 The usage of JFR doesn’t interfere with any Java VM optimizations and has a minimal overhead of <2%. JFR has different events such as instant events, duration events and request-able events. The instant events happen at a single point in time (such as thread start) hence will have the lowest overhead, but the duration events (such as garbage collection, etc) are based on thresholds and similarly the request-able events (such as method profiling samples) are based on a configurable period and hence the overhead will vary for those events. 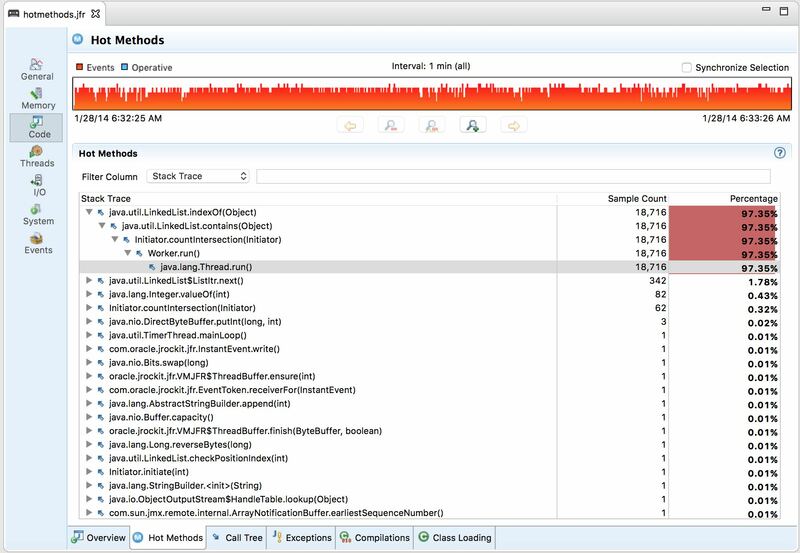 The sampling profiler for JFR doesn’t require the threads to be at a safepoint and doesn’t log every single method call (only detects hot methods). As of this presentation, there is no sampling for threads invoking native code. There are two different kinds of recording: time-fixed (profiling) recordings and continuous recordings. Both are dumped to a file. 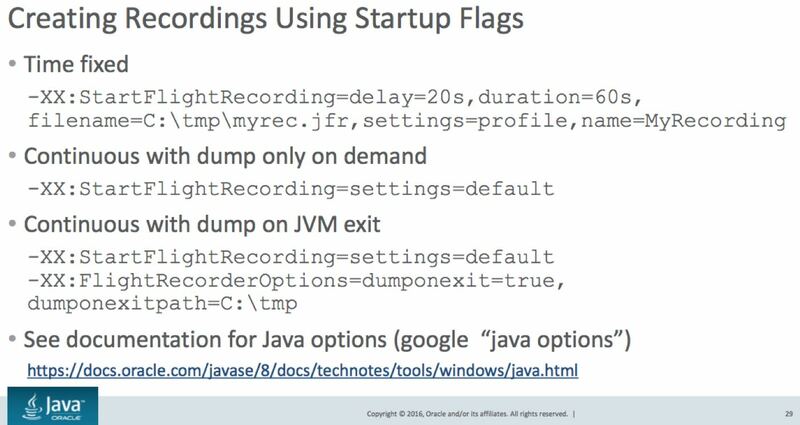 Starting with Java 8 update 40, it is also possible to create a JFR recording at runtime using either the JMC or the jcmd option. 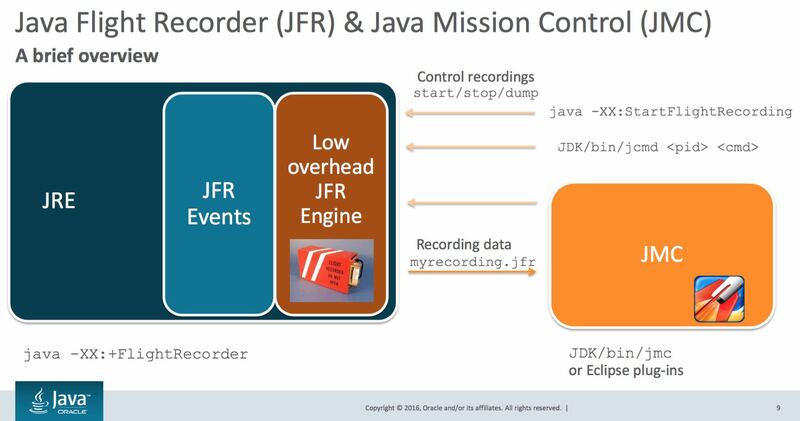 The following three figures show how a JFR recording can be created using one of the three options listed above. Here, when the “Hot Methods” tab is selected, we can see that LinkedList.indexOf(Object) takes 97.35% of the total samples collected. As we drill down the stack, we find that we have a contains(Object) method in a linked list which requires O(n) iterations. In order to fix this, Westin ran another JFR recording which replaced LinkedList with HashSet. The results are shown below. You could work with Westin's demos and more from Marcus Hirt of Oracle's weblog available as a zip package here.